Can you explain why I should use sabots? I'm not opposed to them, just curious. I've read about the Blackhorn powder and how the 209 primers don't move the powder or bullet around. Your rifle has a 1-28 twist and will probably not stabilize a lead projectile real well . It will develop prssures and speed that the lead bullets won't be able to tolerate real well. In other words, it is an accuracy issue. To get the most out of your rifle you need to use sabots. Lead bullets perform very nicely at 1600-1800 in a 1-48 or 1-38. Higher speeds and pressures can give you distortions that will ruin any chance for accuracy. Like I said earlier, you will have to go to the range and check things out. Evry weapon is different and what works great from me may not not so well for you!! So does the sabot speed up the spin and speed, or slow it down? Then I assume this is why you vary the amount of powder. You're trying to get the perfect speed and spin of the bullet that gives the best accuracy and still has the impact to drop the prey. And going a little bit further, why each bullet weight and type may require a different powder load or even a different powder? OK. I'm getting excited, as much as a 62 year old gets excited :-) Now about cleaning supplies. I'll start with the buckhorn powder and sabots, what will work best? And what do I need. All I have is the rod that came with the rifle. I know I'll need a brush and a some patches and something to put on the breech plug so it will come out again. Is the foaming barrell cleaner worth anything. What about the strong cleaner for the breech plug? I haven't tried the Buckhorn powder so I'm not sure about what will cut the fouling the best. With Hodgdon 777 I just use water. With black powder I use hydrogen pyroxide followed by hot water. I use a nylon brush if I need to do a little scrubbing but normally just patches will work. One thing I found when I tried sabots, and the PowerBelts too, is that they shoot better with a dry bore, no lube. The plastic is pretty slick by itself and any lube will make it slide across the rifling. The 1-in-28" twist is too fast for plain lead bullets, they seem to just strip out of the rifling. I tried the Great Plains bullets in my Encore and they just didn't work. If you use Blackhorn 209 just use Hoppe's No 9, or some other gun solvent and stay away from water or you will have an unholy mess!!!! With 777 just use a wet patch and adry patch and load. I strongly recommend the Blackhorn 209 and 209 shotgun primers, but you will have to work out what works best for you!! I am practicing with my long lens and my camera trying to get close to deer and keeping the lens still while I "shoot". I realize it's not hunting season and the deer are easier to approach. But is this where I should be aiming? See attachment. That looks like meat in the freezer to me!!!!!! You get a ramrod with the gun and you need that along with a bronze brush, patches, a bullet seating tool, a cleaning jag, and your chose of solvents. All of these tools with screw into the end of you ramrod. Arecommend a range rod for target shooting and cleaning, and I would also recommend a specail loading jag that rotates as the bullet is pushed down the barrel. This contributes to smooth loading and also better accuracy as the bullet rotates down the barrel and is not forced in over the rifling. I think it is called Super Jad, but will get back to you on that one! Been a long day, so will check in with you tomorrow,so write down your questions!!! If that deer is stationary that is a "good" shot.. However, judging by the position of her right rear leg, she's either kicking at something that's bothering her, or she's still moving. My guess is that she's still moving. Further, the position of her ears suggests that she's at least "aware" that something is amiss, and may bolt at any moment. Since you didn't give a distance to the target, I would suggest that you wait for her to stop walking, or else you may take out the shoulder as she takes the next step. At that angle, if you hit one shoulder, yer gonna hit the other. The shot will still kill her, but yer gonna waste the front half of the deer. 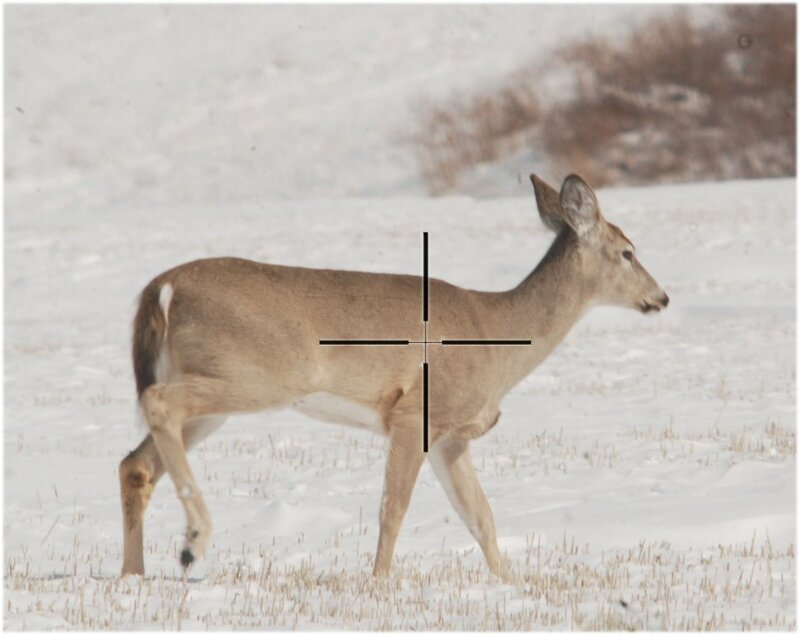 Or you can bring your point of aim down and slightly to the rear off the "point" of the leg (again on a stationary deer) and take away the risk of hitting the shoulder. (I can hear the "neck shot" guys firing up their PC's already). Iowafarmboy, you are correct, itis a super rat and I have one for loading and one for cleaning! Joe is correct in the shot plkacement. I would prefer the top of the bottom post and one inch back. If it goes glow you will take out the lungs, high it will take the spine. Precise shot placement can get tricky with angles, wind, brush, hunter condition, and other possible factors. Regardles of that, it is a prime factor in any hunting. I try not to take moving shots, but itis not alwayspossible. We are going to an auction so I will be out for a good while but I will have some ideas for you on range work when I get back in! Have a good chat and I will be back later!!!! I apologize for the size and number of the pictures. You live and learn. I have an old 1,200mm lens (about 2 feet long) that is at least as hard as a rifle to find the target, keep it in the center, and keep it still while "shooting". None of the "shots" were closer than 100 yards but no farther than 200. I tried one at about 50 yards, but by the time I "found" the deer I wanted, they ran well off. I moved to two different positions to get these shots. Having a variable scope will really pay off. 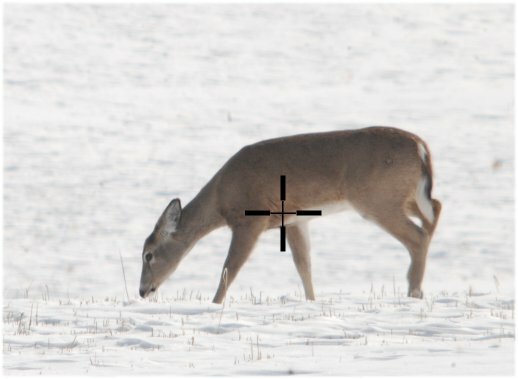 I have never hunted deer before, so this is very helpful. I would have thought that the heart was much higher. The position of the near - front leg seems important both for a better shot at the heart, and ruining less meat. Is a lung shot acceptable? I was "shooting" at about 1/100th of a second. So if the subject is sharp, even if it is moving, the lens is staying with the target. But I think I was only "shooting" stationary targets, like I would for my very first deer. They probably knew I was there. Then there was a road and some houses behind me. The deer were following a little snow drift and they would stick their heads into the snow to eat whatever it is they were looking for. The snow was fairly deep in places and they would really have to lift their legs to walk. Would this be a better shot than the first one (s). Sorry again for putting a duplicate picture in. And one too big at that.